When your eyes go to bed without you, you know it’s just a matter of time. I read an interesting article about how sleep, too much or too little of it, can impact weight. From this, I deduced that a regular-as-clockwork sleep pattern, provided it is no longer than eight and a half hours, promotes weight loss. Let me see, that means that I need to be in bed by ten and up by six thirty – hmmm! Now if I just had the inclination to press the record button on the PVR and turn in at the same time as my eyes. Speaking of veto mode (writing actually), I recently attended a Creative Workshop during which a successful entrepreneur warned budding aspirants about the dangers of the amygdalae (plural). 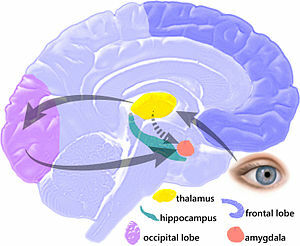 These are nodes in the brain which cross-match stimuli with memories, e.g. this hurt me yesterday, so it will hurt me again today. They act faster than the ‘thinking brain’ (neocortex) and are therefore capable of hijacking rational thought. Fight, flight or freezing are all responses to these cerebral watchmen. I imagine one could measure their victories by counting the number of skid marks due to defeated ‘bright’ ideas, unpublished novels and those magnificent men in their flying machines. All creative people need to overcome these dream-breakers. I personally need to spring clean my memory bank and obliterate the words of every sceptic I know. I’m learning not to give a progress report to hijack victims, no matter how well meaning they might be. I am convinced that almost all successful writers, creative people and innovators must have conquered their natural reactions to rejection. Whilst critiques, reviews and tests are a given, most dreamers, in subliminal anticipation of the amygdalae, repeatedly screen their creations before exposure to scrutiny and are not swayed by adversity. Before the amygdalae hijack your emotions yet again, let go of your creation, kick back for TV therapy on the ceiling, exercise something other than the grey matter, and go to bed with your eyes. Who knows, you might even lose some weight! Amygdala hijack is a term coined by Daniel Goleman in his 1996 book Emotional Intelligence: Why It Can Matter More Than IQ.